Insulation is important because it can help significantly with bills and energy consumption as a whole. Homes become that much easier to live in. The reason insulation is critical comes down to making sure the weather outside does not dictate temperature inside. Plus, who wants to have water related concerns with issues. Insulation is a big part of how to make sure the temperature outside remains outside. With insulation being used, cooling and heating costs will go down in a hurry. Leakages of anything should be controlled and insulation is going to do this including air and/or water leaks. Insulation is tested with the use of the ‘R Value’ to see how well it can resist thermal energy. This can be installed in a number of locations such as heated and/or unheated space. Home insulation does not come in one type only. Plus, it has a number of pros and cons. It is important to make sure this is considered. The options can include things such as blankets, loose fill, rigid board, plastic foam, reflective, batts, and blown in options. For DIY projects, blankets and batts are the best. This is where you don’t have to call in the pros. They are also the cheapest to put in compared to other options. With the use of plastic, polystyrene fiber, concrete block, mineral wool, and fiberglass, these two insulation types are great. However, please do realize fiberglass can cause allergic reactions in people. You have to consider this well in advance. You should always make sure natural minerals are being used for mineral wool insulation. Things such as sound reduction and fire protection are also kept in mind. For plastic fiber glass insulation, recycled plastic bottles are employed. Vermiculite, glass, and fibers are used for loose fill insulation. These are reserved for areas such as walls and attics only. For cellulose insulation, recycled newspapers and wood fibers are used. The best resistance is an insect repellent when it comes to fire. It is good for dealing with moisture. Aluminum foil, cardboard, and plastic films incorporate reflective insulation. They are great for dealing with the heat in the hotter days of the year. However, it is important to remember they can become safety hazards with electrical equipment around. With foam board insulation, water and heat leaks are taken care of. Resistance to moisture is important when it comes to walls and ceilings. This makes sure the thermal resistance is dealt with as needed. 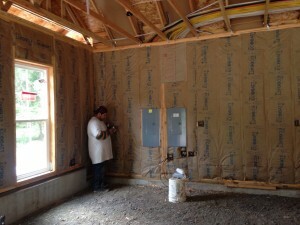 Insulation is needed for a number of areas in the home such as the garage, ceilings, storage areas, attics, and exterior walls as that has a role to play. It is important to make sure appropriate care is being considered in the short and long term. Leaks of all kinds are going to have a role to play and that should be kept in mind with regards to the type of insulation being put in. Always make sure all electrical components are being looked at well in advance to ensure damage is not caused. Health concerns have to be kept in mind as needed when it comes to allergies and respiratory problems because these issues can creep up over time and that is the last thing one needs to deal with. We work in Milwaukie, Tualatin, and the Portland metro area. Give us a call today if you need help with your project!